Just mix with water (or beer!) 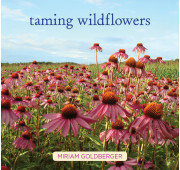 – it will stick to most anything, including bare soil, stone, and weathered concrete. 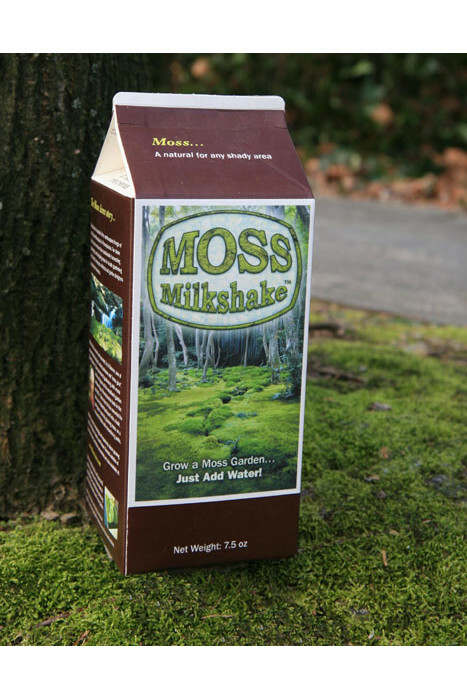 Hypnum moss is ground dry and then blended with a proprietary mixture of growth stimulants including powdered buttermilk and a water retention gel and then packaged in an air-tight half gallon milk carton. Coverage rate is typically 20 square feet. Alternatively the mix can be sprinkled about dry and then watered in. Indefinite shelf life. Since moss obtains all its nutrients from the air (moss has no true roots), moss plants require nothing more than shade, acidic soil, and adequate moisture to flourish. All moss plants need is a firm soil bed in a location with adequate shade. It is also important that the area in which moss plants will be grown is blown or swept clear of any existing plants, leaves or debris. 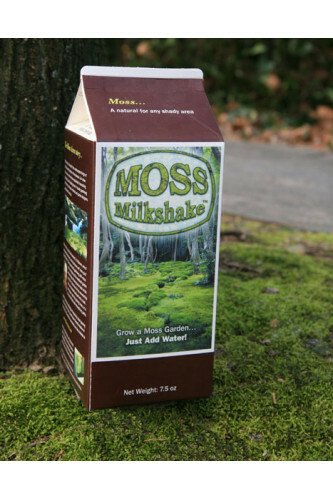 Moss also prefers poor quality soils with low nutrient levels. Before utilizing moss as part of your shade gardening plans, test the soil bed to ensure that the pH is between 5.0 and 6.0 (lower is OK - 6.5 is max., but not ideal). If necessary, the soil for the moss can easily be amended with some liquid sulfur or aluminum sulfate to lower the pH to the desired range. Once the moss is placed onto the soil simply keep the area watered regularly for the first 2-3 months to help it get established.